The Bowflex Select Tech Weight Bench Series 5.1 is one of those few weight benches you’ll find on the market that you can safely say it’s just perfect for anyone who wants to use it with free weights. This weight bench is specifically engineered for people who want to build muscle and tone their body by using high quality dumbbells and work out from the comfort of their home to achieve the best possible results. Pairing the Bowflex Select Tech best weight bench with a pair of high quality dumbbells or barbells, you’ll be able to replace other expensive machines that would cost literally thousands of dollars to buy. Allows you to turn your room into a free weight fitness center. Stabilizes positioning and corrects posture for a muscle building free weight workout that’s effective and safe. Added decline position support offered by the removable leg hold-down brace. Can be adjusted to 6 different positions, but also from a seventeen degree decline to a ninety degree decline. 1 year warranty on upholstery and 30 years warranty on the frame. If you though that this weight bench can only be used for one or two exercises, then you’re absolutely wrong since with a good quality pair of dumbbells, you can consider dozens of them. In fact, you can use it in order to train your triceps, biceps and back while seated, but you can also use the leg brace in order to pump your abdominal muscles. The Bowflex Select Tech Weight Bench Series 5.1 is generally designed for those who want to train their upper body, therefore being a great choice for those who want to have bigger arms, a bigger chest and great abs. With the adjustable backrest, you can change the decline of the bench from seventeen and up to ninety degrees using a total of six different detent steps. Therefore, if you had posture problems in the past, then stop worrying about them, since the Bowflex Select Tech will help you correct them in time. Given the fact that the Bowflex Select Tech has a weight capacity of three hundred pounds, it can be used by people who are not very big and are looking for a great weight bench that offers them the chance to train effectively. Don’t worry if you’re close to the bench’s maximum weight limit, since it still remains stable even when it’s stressed like this. As for the size of the bench (which many are interested, given the fact that not everyone has a big home) it measures twenty six inches in width and fifty six inches in length. Weight wise, it weighs sixty one point seven pounds when it’s completely assembled, but since it comes with wheels, moving it around is a breeze. 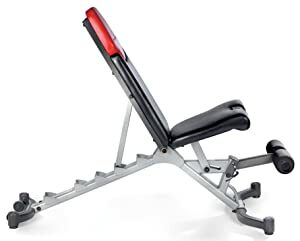 Overall, the Bowflex Select Tech is a very stable and solid weight bench that can be used effectively by anyone who wants to train effectively at home. The price is also acceptable and given its sleek design, it should easily become the centerpiece of the room you plan on installing it in.